Phillipa Soo, star of Broadway’s critically acclaimed show Hamilton, is a 2016 Tony Award nominee in the category of Best Performance by an Actress in a Leading Role in a Musical and winner of the Lucille Lortel Award in 2015 for Lead Actress in a Musical for her portrayal of Eliza Hamilton. 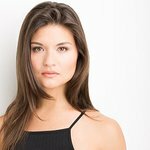 After graduating from Juilliard in 2012, Soo was cast as ‘Natasha Rostova’ in the Ars Nova production of Dave Malloy’s Natasha, Pierre & The Great Comet of 1812, and appeared on the NBC television series “Smash” in the role of Lexi. Along with the cast of Hamilton, Phillipa founded The Eliza Project to help young teens at Graham Windham, the nation’s oldest child welfare agency, founded in NYC in 1806 by Elizabeth Schuyler Hamilton and others. Google trends for "Phillipa Soo"
We don't have any videos related to Phillipa Soo.